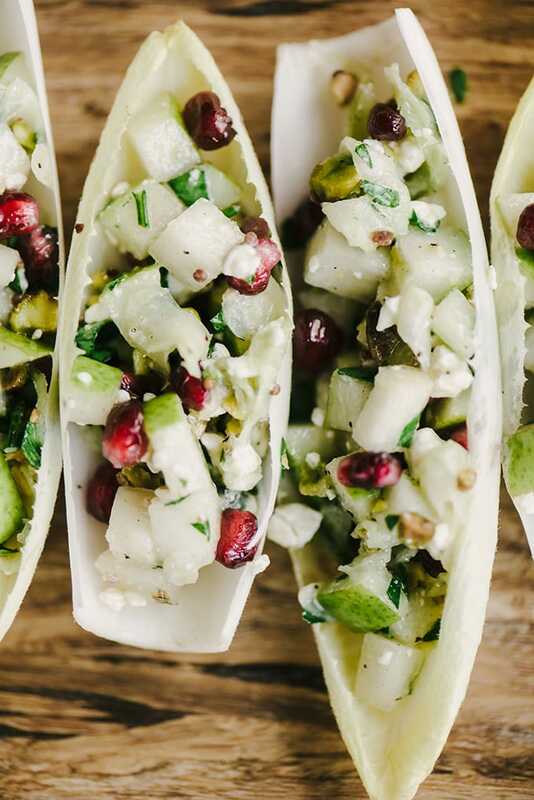 Holiday party season is just around the corner, and I’ve rounded up my favorite easy, fast, and/or make-ahead holiday cocktail party appetizers to make your prep just that much easier! Y’all we are just about to round the corner into the final stretch of the holiday season. Deep yoga breaths, all together now. To be perfectly honest, I love the madness. I can leave that pile of clean laundry in the basket and totally justify my inability to keep house properly because I’m just too darn busy “making memories”. My increased consumption of bacon and chocolate becomes “festive”, and there are infinite reasons to keep the liquor tray stocked with bourbon. Truly, it’s the most wonderful time of the year. Also, parties. 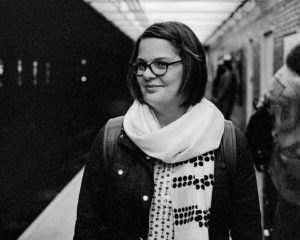 As a former event planner, I have a deep affection for parties, even if throwing them together makes me feel like an unhinged wildebeest masquerading in a pair of sparkly flats. That is precisely why I have an arsenal of easy and fast cocktail party appetizers to make holiday party planning just that much more realistic. They are an integral piece of the holy grail of event planning success – easy apps + lots o’ booze + waterproof mascara. 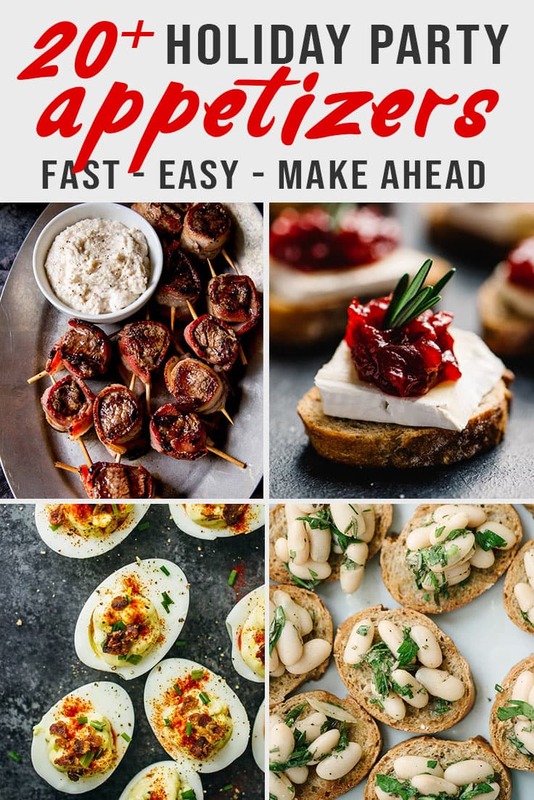 Last week I shared some new and old favorites, and this week I’m rounding up over 20 easy, fast, make-head cocktail party appetizers. From me and my friends to you – you’re welcome. Cheers! 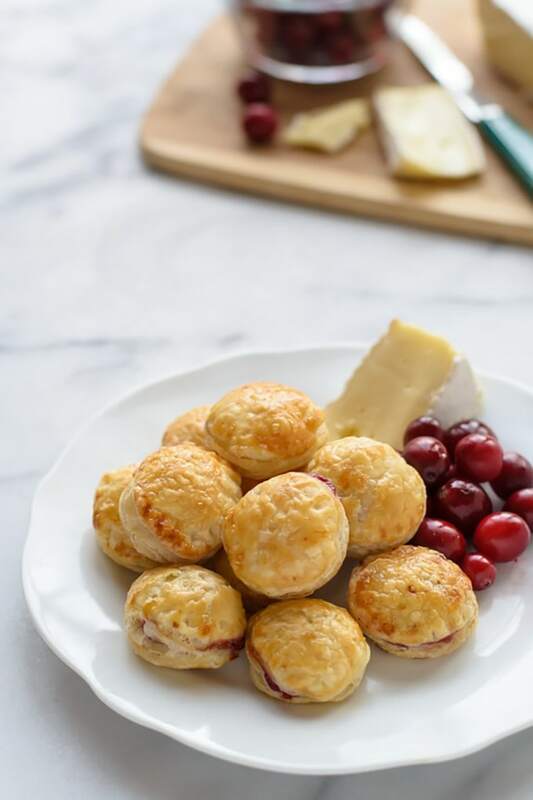 Some combination of brie and cranberry is the gold standard of holiday fare, and these cranberry brie bites deliver! 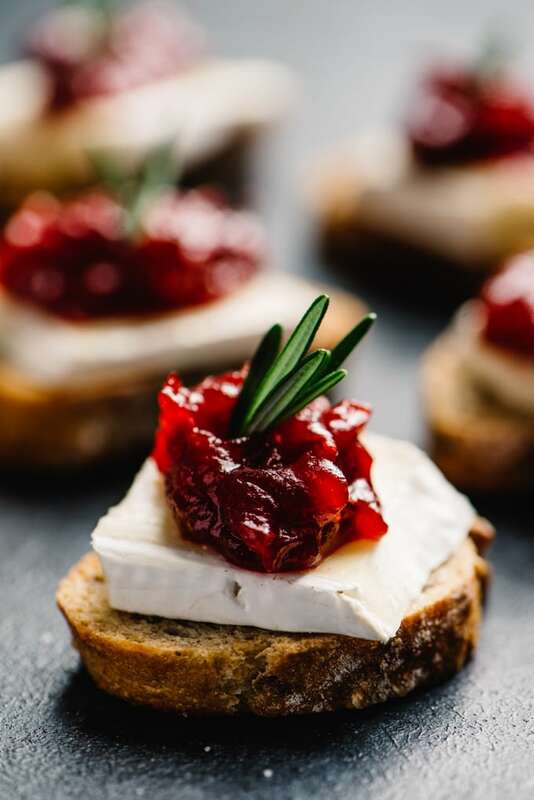 The cranberry jam and crostini can be made in advance, so you’ll need just 10 minutes on party day to assemble these adorable two-bite delights. Photo and Recipe by yours truly. 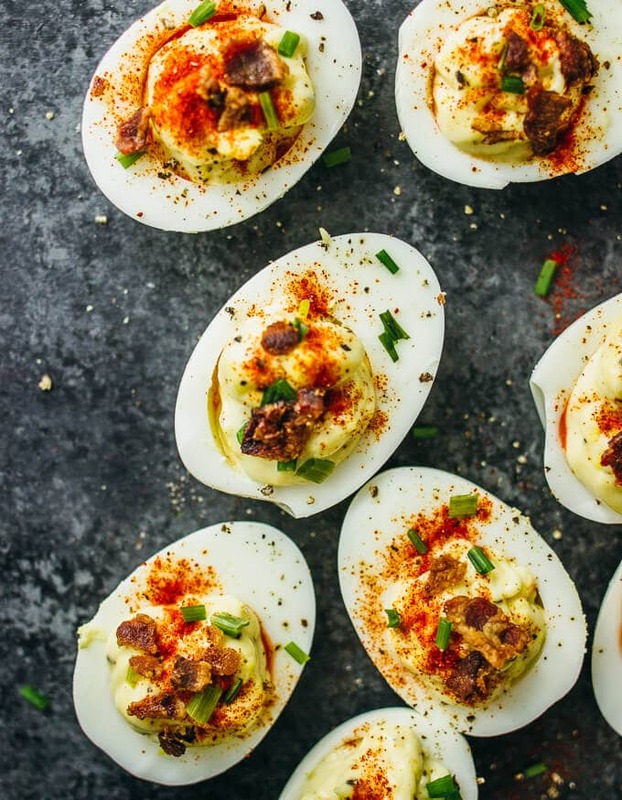 Every holiday party needs a deviled egg, and Cam is drooling over this version. He loves himself a deviled egg or ten at a cocktail party, and the incorporation of Sriracha in this recipe has got him all fired up. Photo and Recipe by Savory Tooth. Ah, the cheese ball. The ubiquitous holiday party offering, much beloved by young and old. I love a classic cheese ball, but these mini guys? They. Are. Adorable. Ready in just 15 minutes or give yourself the gift of convenience and make them in advance. These guys are easy, fast, fresh and perfectly seasonally hued. They’re ready in just 20 minutes. Plus I can call them a canapé…fancy. Oh la la! Photo and Recipe by Our Salty Kitchen. 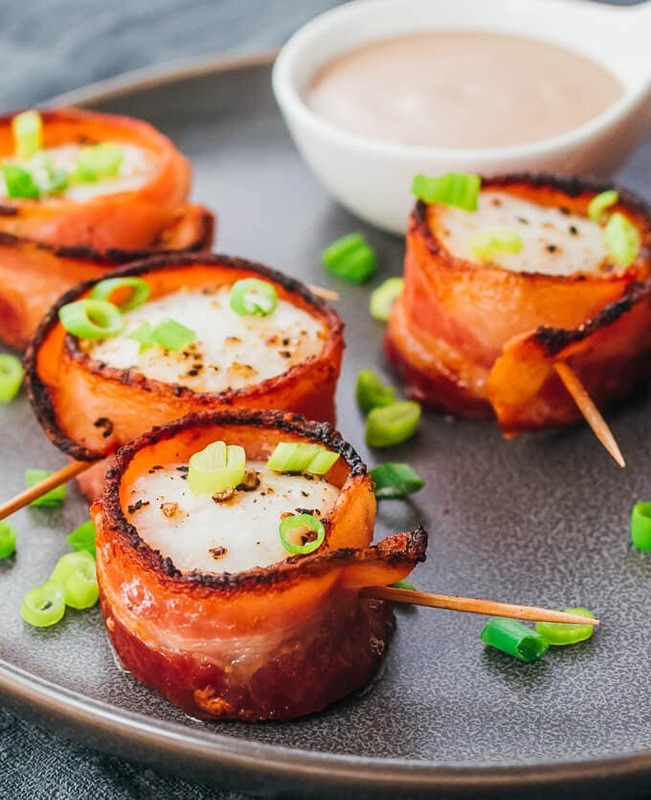 I was had at four ingredients, with the bonus of bacon being one of them – that’s my kind of cocktail party appetizer prep. Swoon. These take just a scotch longer than 30 minutes, but you can easily do the prep work in advance and then pop those bad boys into the oven just before party time. Photo and Recipe by Unsophisticook. Thank you, vegan friends, for making me scratch my head and come up with this recipe for the best damn bruschetta I’ve ever had. 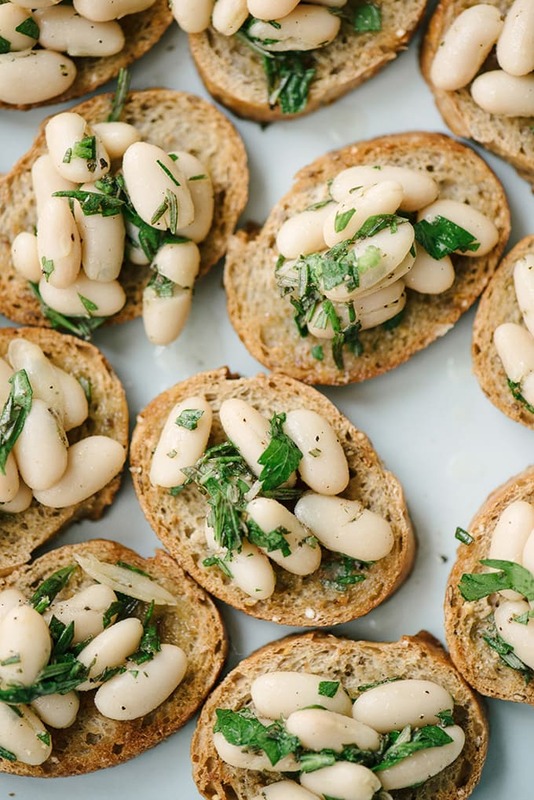 Honestly, who knew beans on toast could be so damn good? 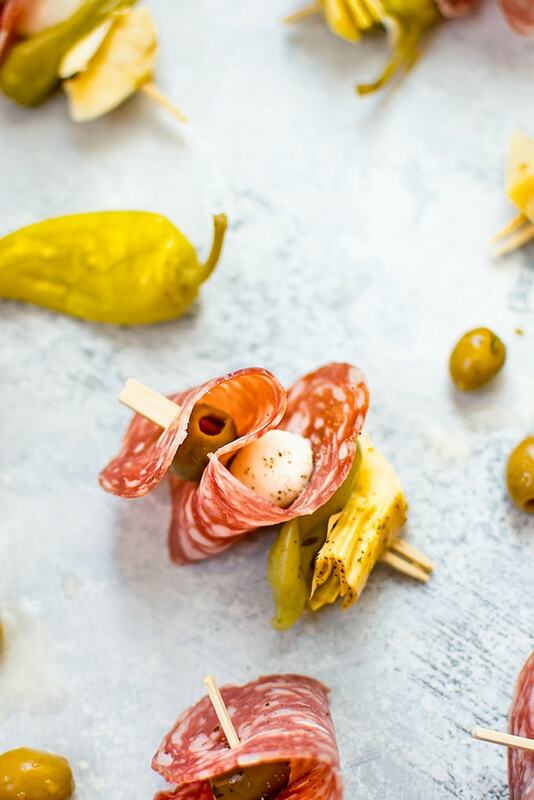 Proof that I’m not a bacon-eating mongrel 100% of the time, as evidenced by how much my draw dropped to the desk when I saw these stunning canapés. Hello beautiful – get into my belly stat. Photo and Recipe by Killing Thyme. Yes, more bacon. 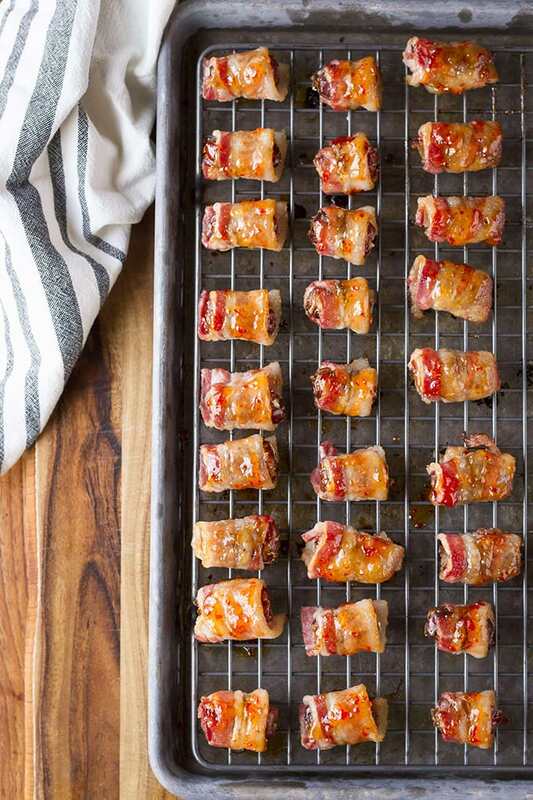 Because if you can’t overindulge in bacon during the holidays seasons, it’s just not all that merry. My friend Lindsay makes the most epic, most extra cheese boards and this one is no exception. 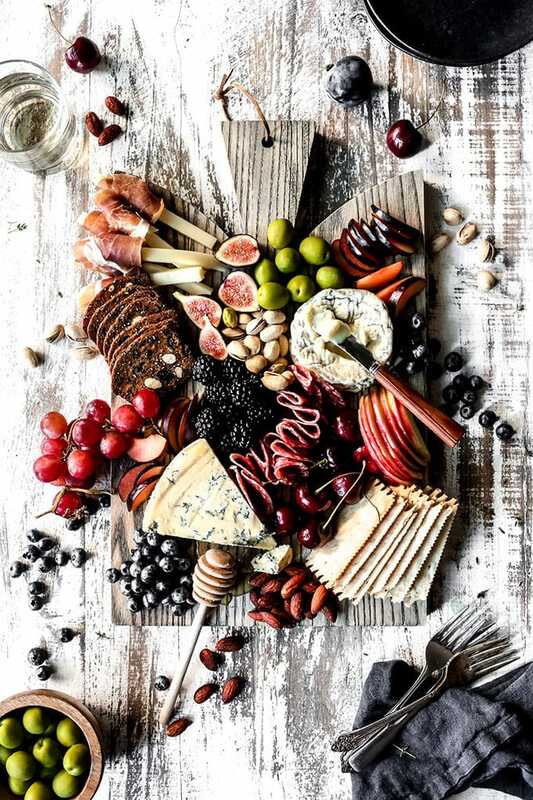 There isn’t really a “recipe” to a cheese and charcuterie board, but I always look to her boards as inspiration to find the right balance of cheesy, meaty, crispy, and salty for my cocktail party appetizer table. She’s an ace. Photo and Recipe by With Salt and Pepper. No cocktail party spread is complete without a dip (or two…or three! 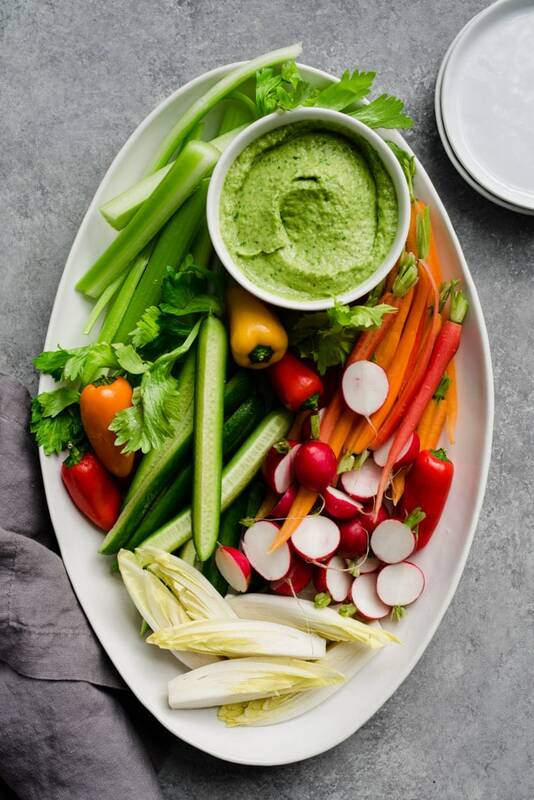 ), and I love offering this vibrant, tart and tangy white bean green goddess dip. Naturally vegan and gluten free, it’s a healthy, but creamy and luxurious, dip to round out any holiday menu. Pumpkin. Beer. Pretzels. Shut the front door. 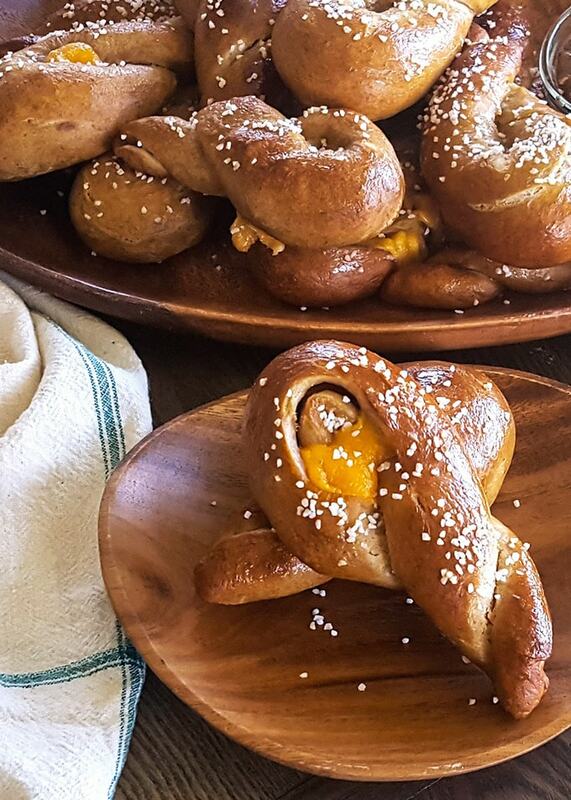 These take a little work and advance prep and planning, but in my fairly extensive pretzel making experience (seriously, I love homemade pretzels so hard), I’m fairly confident you can make these ahead and then gently reheat before party time to get the cheese soft and gooey again. 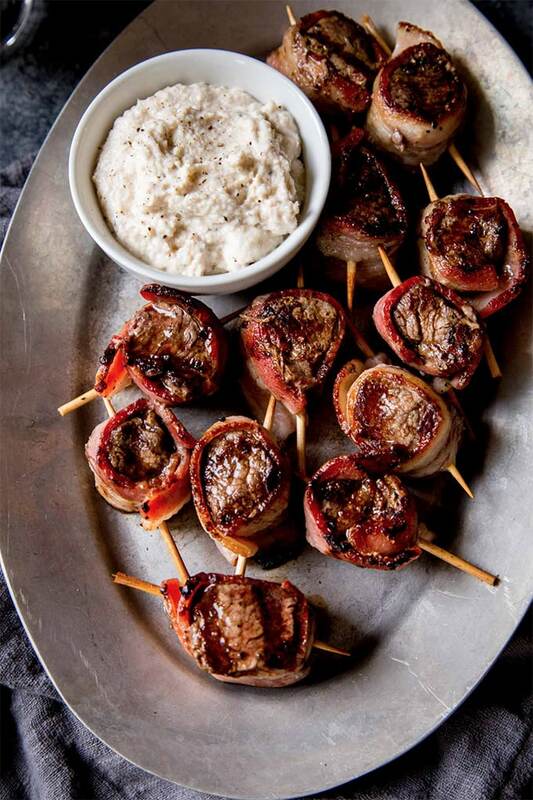 Photo and Recipe by Feast In Thyme. 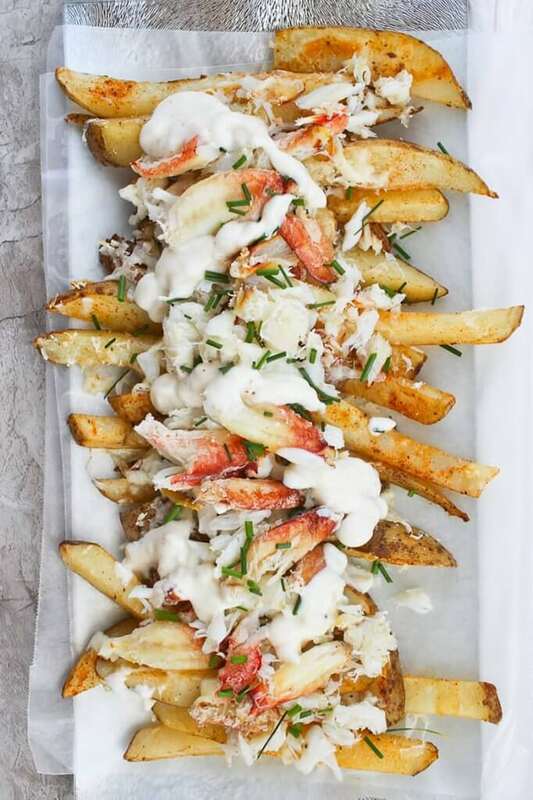 Yes, crab fries. Cheesy, briny, chivy, delicious crab fries. These would be an excellent choice for a more intimate tapas-type gathering with a small group of friends than a traditional cocktail party. This is mostly because I would legit sit with the plate of fries in front of me and occasionally allocate a fry, perhaps two, to a friend. If you’re not as greedy and horrible as I am, a big ol’ pile of these would be an excellent family style appetizer. Prep that crab in advance and this plate of awesome is ready in less than 30 minutes. Photo and Recipe by Champagne Tastes. I cannot get over these tartlets, or if you want to feel fancy, canapés. Oh la la. 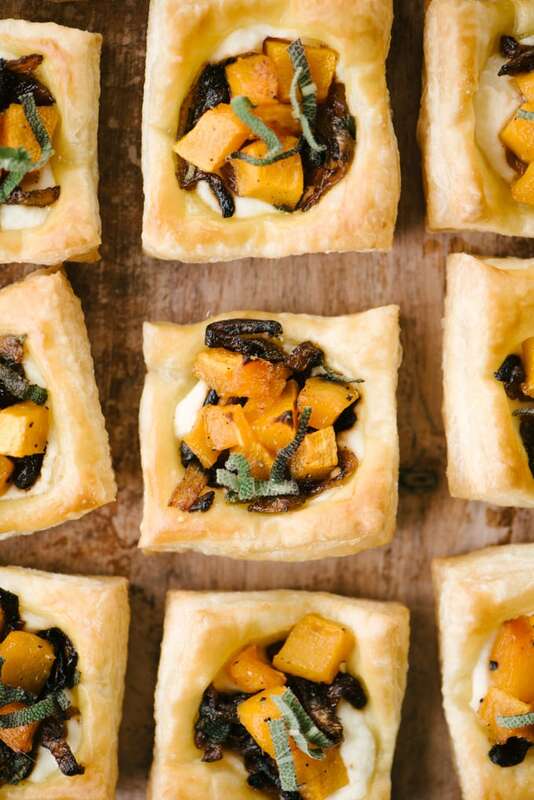 These mini butternut squash tarts are the perfect vegetarian two-bite holiday party appetizer offering. They look so chic and elegant, but thanks to the magic of puff pastry, they’re a snap to pull together. Yes, yes, yes. This, all day. Please and thank you Santa. Again with the bacon, so you know exactly how much self-control I exhibit throughout the month of December. Also that horseradish dip situation is perfection. 30 minutes, and these can win you that coveted hostess with the mostest award you know you’ve been vying for. Photo and Recipe by Platings and Pairings. I love these. Easy, elegant, colorful, fast, and fresh. Make ’em in advance, or set aside 20 minutes before party time. Or better yet, have a helper make them for you. 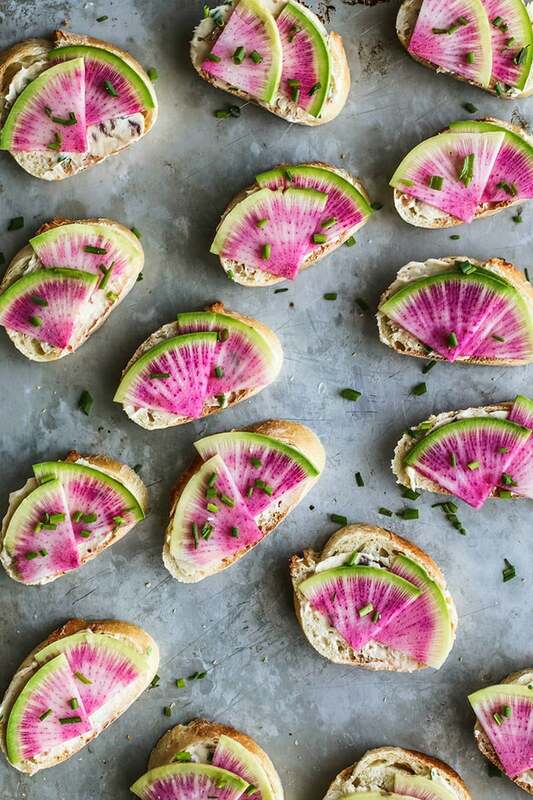 Photo and Recipe by Salt and Lavender. 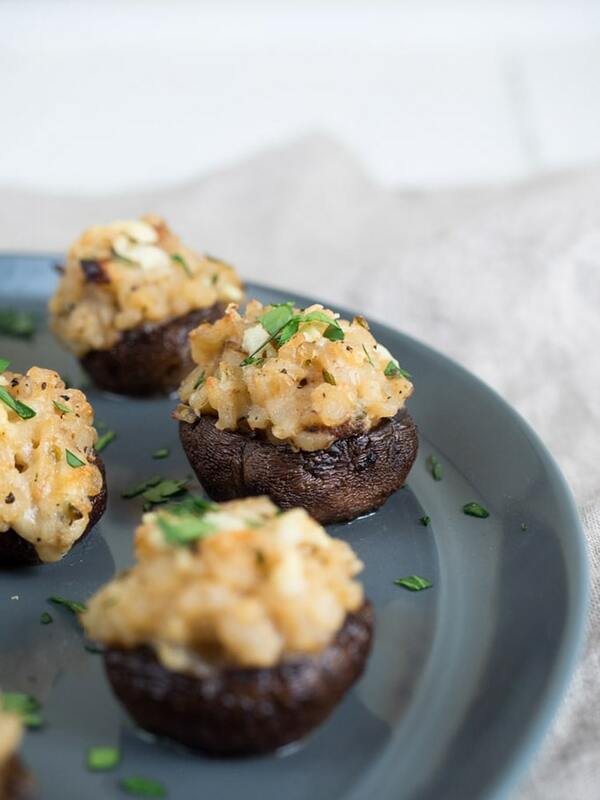 I was all kinds of swoony and drooly when my friend Elaine published these risotto stuffed ‘shrooms back in the fall and I’m still super into them. She makes them with lazy lady risotto, which means she is both smart and frugal – AKA, cocktail party appetizer heroine. Photo and Recipe by The Seasoned Vegetable. These are adorable, and I’m 99% sure the flavor explosion that will happen in my mouth will be epic. 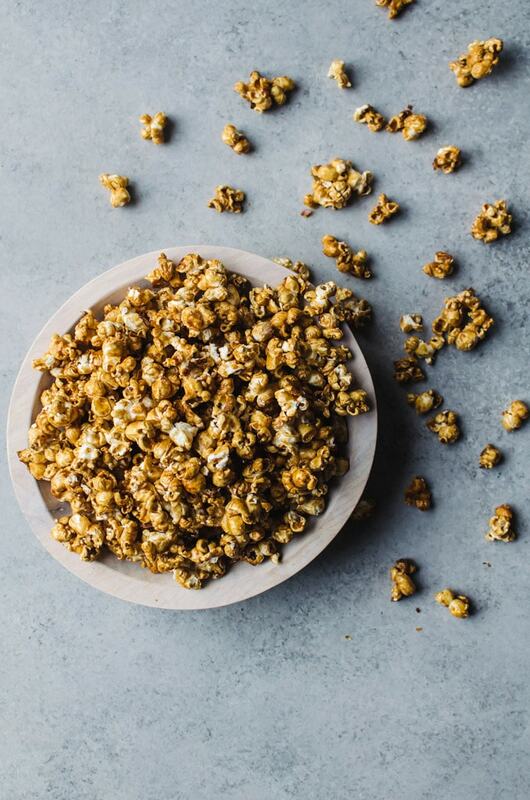 Photo and Recipe by We Are Not Martha. 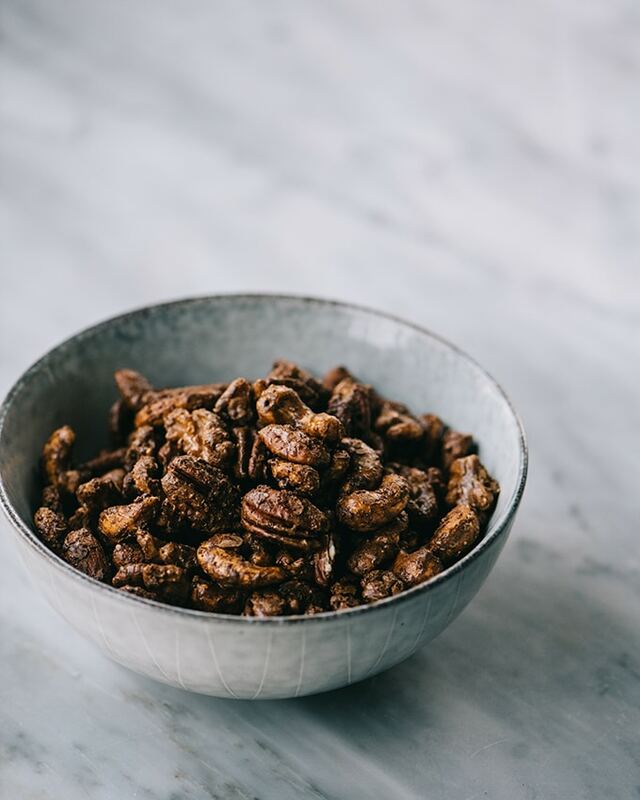 Spice up your cocktail party with these gingerbread nuts. I’m sure there’s a dirty joke in there somewhere, and doubly sure one of y’all will make it. 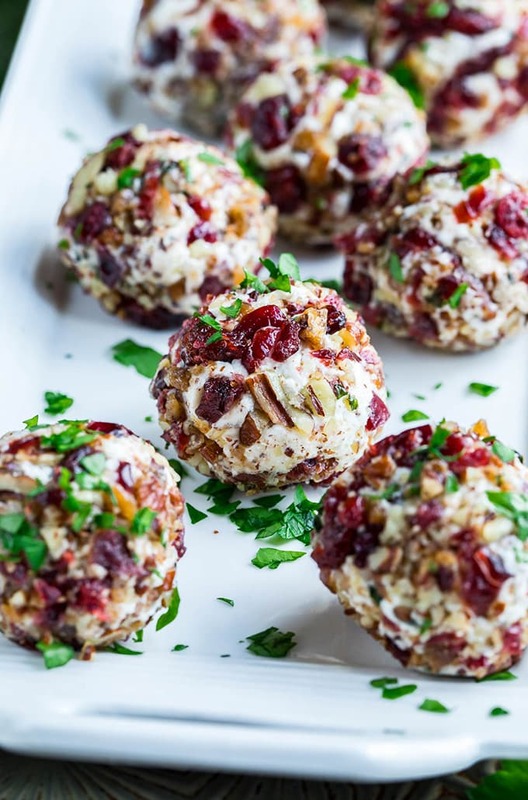 I’m not normally a chicken salad fan, but but Katie from Healthy Seasonal Recipes has totally won me over with these easy, fast, and so perfectly seasonal bites. Plus she styled them with wine. So much winning. 15 minutes to bliss friends! Photo and Recipe by Healthy Seasonal Recipes. More brie and cranberry – YAZ! 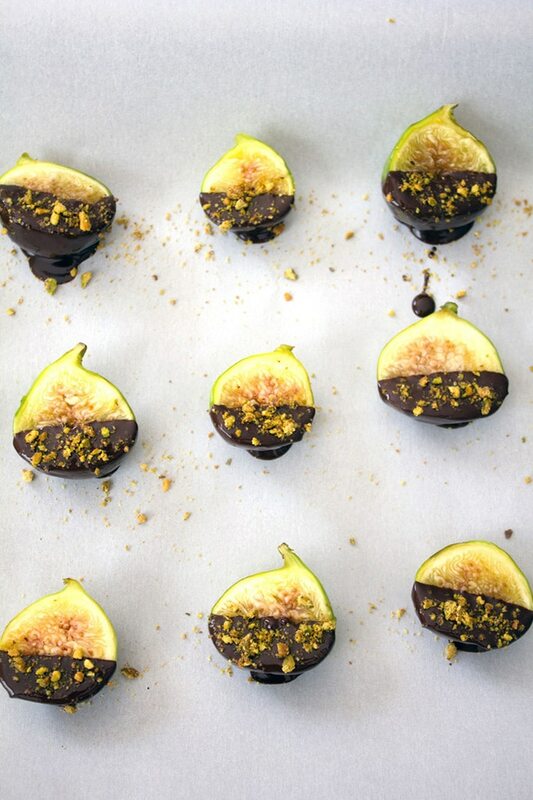 Erin from Well Plated knocks this universally crowd-pleasing flavor bomb out of the park. 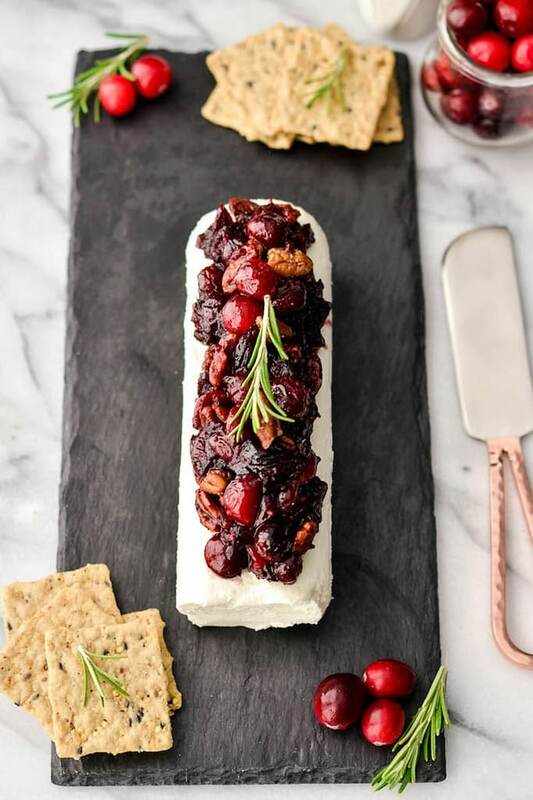 They should be called crackberry brie bites, because they are. 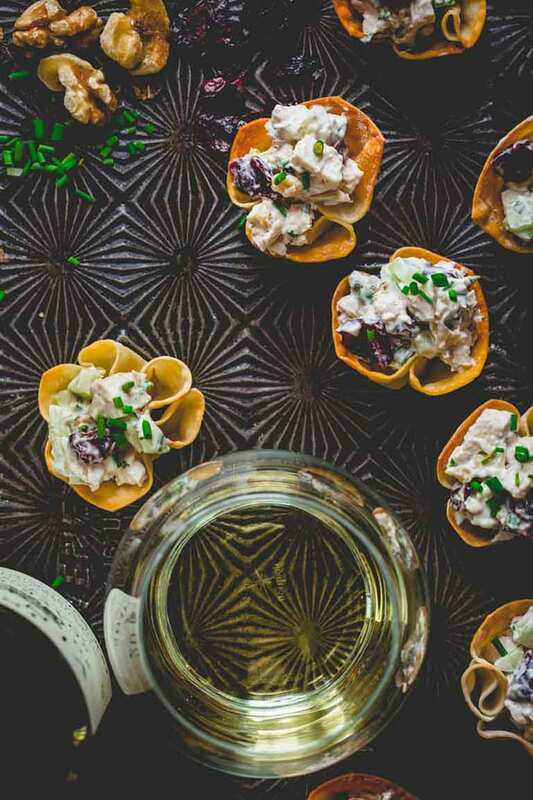 I recipe tested a make-ahead version of these adorable appetizers, and they were perfect. After assembling the bites through step 4, I popped ’em in the fridge overnight. They came out perfect the next day. Photo and Recipe by Well Plated. The ultimate two-for: boozy bites! It’s like she knows me. Excuse me while I make a batch of this, and then nibble on it all December while my kids sneeze in my face – because alcohol kills germs. Amanda claims this keeps for up to 5 weeks in an airtight container, but in reality, good luck with that. Photo and Recipe by A Cookie Named Desire. Honestly, this feels too pretty to eat. But eat it you will. 20 minutes gives you this enviable spread. Photo and Recipe by Joy Food Sunshine. 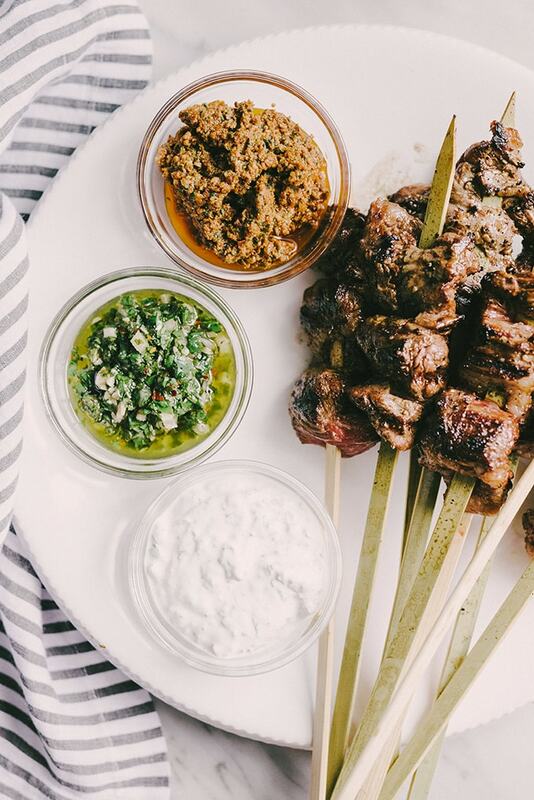 No holiday party is complete without food on a stick, and you’ve got lots of dietary bases covered with these skirt steak skewers with dipping sauce trio. Making the dips and skewer the steak pieces in advance. Once party time hits, the skewers grill up in less than ten minutes, and you can easily distract all the men and kids by sending them out back to “man” the grill (look kids, fire!). My pleasure – love your work!